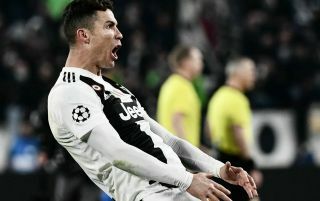 Juventus superstar Cristiano Ronaldo has reportedly been charged for his ‘cojones’ celebration in the Champions League win over Atletico Madrid. According to the Daily Mirror, the Portugal international will most likely just pick up a fine like Diego Simeone did for his similar celebration in the first leg win, which this was most likely making reference to. Ronaldo probably won’t, therefore, miss any games as Juventus hope to continue their march to this season’s final in their quarter-final game against Ajax. The 34-year-old has been a star performer in this competition down the years, winning four of the last five finals at previous club Real Madrid. One imagines Ronaldo was very much signed with that aim in mind for Juventus, so they won’t want to lose him for any extended period. While it will have undoubtedly been tempting for Ronaldo to aim a dig back at Simeone after helping Juve come back against Atletico in such dramatic fashion, he could do well to keep his emotions a little more in check in the future.